Researchers at the University of Cincinnati are perfecting an innovative way to track the migration of elusive wildlife to help in their conservation. UC professor Brooke Crowley studies feathers plucked from hawks captured for leg-banding in Idaho. Cooper's hawks and sharp-shinned hawks are small, predatory raptors that live across North America. They can be difficult to study because of their secretive natures. "They're hard to find. They're cryptic birds that are solitary. They're quiet. They hide," Crowley said. Crowley, an associate professor of geology and anthropology, is no stranger to her research subjects. Her father is a lifelong falconer who worked with these small hawks when she was growing up in Colorado. "Cooper's hawks are like little dinosaurs. They're pretty vicious," she said. Traditionally, biologists studied birds by placing numbered bands on their legs and recapturing them. Because they are so wide-ranging, few banded birds are ever caught twice. More recently, biologists have used satellite telemetry or transmitters that record the sunrise and sunset to track migration around the world. But UC's approach can do something these other tools can't: pin down where birds hatched. And this could help wildlife conservationists identify the most important habitat for the birds' long-term survival. "We're using a dual isotope approach: strontium and hydrogen," Crowley said. "Strontium reflects geology and hydrogen reflects precipitation patterns. They're highly complementary." Strontium is one of the most common elements found on Earth. But its isotopes vary greatly depending on the geology of the area. Likewise, the isotopes of hydrogen found in animals varies widely depending on how much rain or snow falls in a region. Geologists have created detailed maps of these isotopes. Animals absorb the isotopes in the food chain. Just as human hair contains information about the person's health and diet, the isotopes in feathers give each bird a unique geographic signature. Crowley used a similar technique last year to study Henst's goshawks, an elusive bird of prey found in Madagascar.
? "This is a map of strontium ratios in North America. And here are hydrogen values. So any bird with a different value of hydrogen or strontium than what we find here must have come from somewhere else," she said. The UC professor is collaborating with Clément Bataille of the University of Ottawa and Idaho bird researcher Bruce Haak (whose last name indeed is pronounced "hawk"). Crowley has feathers collected from banded hawks in each of the past three years. Among them are feathers taken from fledglings, birds that haven't yet left their nests. These feathers will help Crowley determine if her isotopic analysis is valid. "So we can confirm the model is predicting correctly where the birds came from. Hopefully, the answer is yes or else there is a problem," she said. "We'll have to tweak the model." One potential complication is human activity, she said. People water lawns and golf courses, artificially increasing the hydrogen values. And construction crews truck in clean fill from distant places for new projects, which could change strontium levels in hawks that live near suburbia. Crowley presented her initial findings this month at the Geological Society of America's annual conference in Indianapolis. Preparing feathers for the analysis is tedious and time consuming. The feathers have to be cleaned meticulously to ensure the accuracy of the elemental analysis. Then the feathers are placed in tiny ceramic cups and burned to ash in crucibles for the elemental analysis. 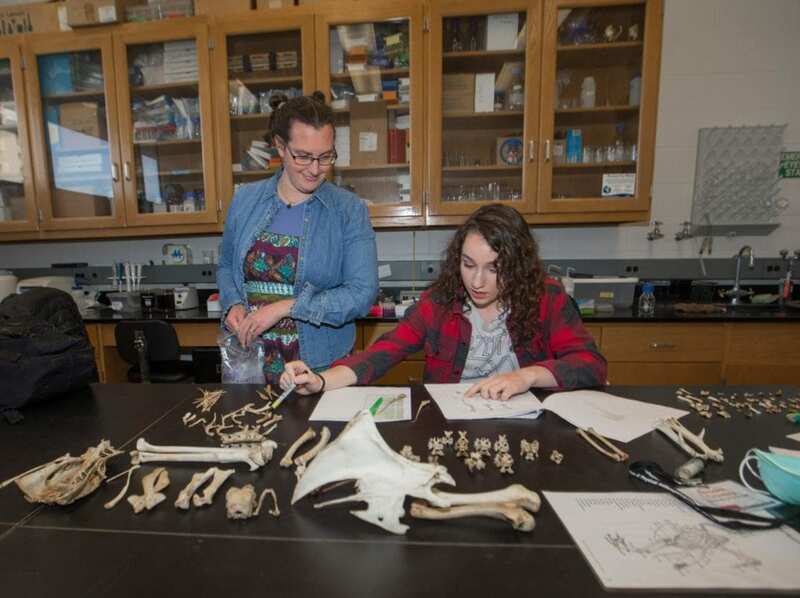 UC archaeology student Madelyn Moeller helped Crowley prepare the lab samples. On a recent weekday, Moeller worked in Crowley's lab cataloguing bones in a turkey skeleton. The professor maintains a diverse collection of wildlife bones for her zooarchaeology classes. "I was pretty excited to work on a project like this that could help with conservation. I'm really into the environment," Moeller said. Moeller said she appreciated the opportunity to get experience in lab research. "It was the best luck being part of this," Moeller said. "Working in a lab as an undergraduate is really going to help in the next few years of my education." UC's study could have long-term implications for endangered wildlife. Knowing the habitat needs of animals is perhaps the most important step toward their conservation, Crowley said. And birds of prey can be very picky about where they nest. "This method is useful for migratory species and wide-ranging species. These hawks travel great distances. So it's hard to know where a bird originated just by capturing it without isotopic analysis," she said. Crowley has conducted research on topics as diverse as road pollution in the Himalaya mountains to lemur conservation in Madagascar. But the hawk study resonates especially strongly with her father, she said. "I owe all of this to him. I think he's really excited I'm working on a project about something he deeply cares about," Crowley said. "He's always been very supportive, but you can see an extra spark in his eyes when I talk about this one."